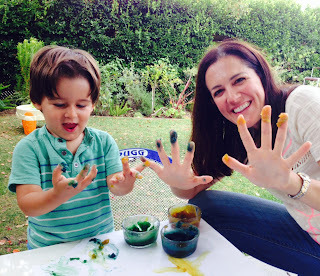 Non-Toxic Munchkin: VIDEO TUTORIAL: Homemade Non-Toxic Finger Paint; Easy, Safe and Super Fun! VIDEO TUTORIAL: Homemade Non-Toxic Finger Paint; Easy, Safe and Super Fun! I love art- it is my favorite mommy-munchkin activity. My kids love art- they are always up for art in any shape or form. Having said that, art supplies kind of freak me out. I know many say 'non-toxic,' but when it comes to art supplies my little kiddos are touching, smelling and let's admit it, probably tasting, there is a peace of mind that comes from using paint and art supplies that we make ourselves from ingredients that are in our kitchen. Not only does it turn the activity into a two-for-one ("cooking!" then "art time!") but I don't have to be on top of them, making sure they don't ingest it as they smear it all over their bodies- paper!! So we decided to try out a recipe the great folks at Healthy Child Healthy World shared last week. It was so easy, fun and kept them (especially the 2 year old) entertained the entire afternoon- so I wanted to share it ASAP! Once the mixture has cooled, all you have to do is divide it into as many containers as you would like (you can also use a cupcake mold for portability) and add a few drops of food coloring: and voila you are ready to paint! Part 2: Time to do some art! Have fun and let the kids get as messy as they like!